UltraMAX™ is a highly durable heater duct designed for portable / temporary heating applications with temperatures up to 550°F. UltraMAX flexible ducting is produced with a high grade silicone fabric which is specially coated with PTFE (sometimes referred to as Teflon), providing a low coefficient of friction, so oil and other liquids don’t stick to the duct as much as with some other fabric ducts, making it ideal for the oil and gas industries. 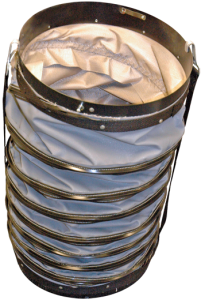 UltraMAX™ is available in diameters from 4″ to 60″ and in lengths up to 50, with options to fit virtually every portable heater.